It’s just been all squid, all the time this week here at KQED. If you were a sucker for our TV story on Humboldt Squid, don’t miss the new PBS web original video of the last orgiastic hours of Market Squid, also known as Inia geoffrensis. 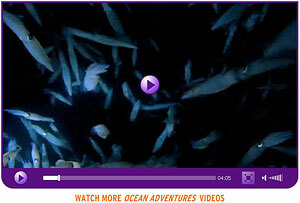 The squid, along with pink dolphins and matamata turtles are all stars of the new Jean Michel Cousteau: Ocean Adventures web original video series, produced for PBS by KQED and the Ocean Futures Society. Craig Rosa is the Interactive Producer for QUEST.